Eight graves! 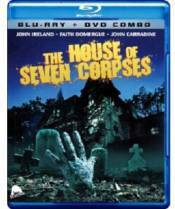 Seven bodies!" screamed the ads, "One killer... and he's already dead!" Hollywood legends John Ireland (RED RIVER, SATAN'S CHEERLEADERS), John Carradine (THE GRAPES OF WRATH, VAMPIRE HOOKERS) and Howard Hughes' paramour Faith Domergue (CULT OF THE COBRA, THIS ISLAND EARTH) star this much-loved '70s shocker about a film crew shooting an occult drama in a sinister manor - actually the former Utah Governor's Mansion - with it's own grisly history of family bloodshed. From it's notoriously gruesome opening to the creepy zombie-attack climax, revisit the old-school favorite that Bloody Disgusting hails as "a classic Saturday afternoon 'Creature Feature' scare" as you've never seen it before, now transferred in HD from original vault materials and featuring an exclusive archive interview with the legendary horror icon Carradine and a revealing new audio commentary. Bonus Features: Exclusive Interview with Star John Carradine; Audio Commentary with Associate Producer Gary Kent Moderated By the Alamo Drafthouse's Lars Nilsen.